With its Roadster concept, Linde Material Handling has set completely new standards in terms of visibility and safety for industrial trucks. The company is now adding one of the most promising energy systems to the advantages of this unique design: It’s curtain up for the first Linde Roadster with fuel cell drive! 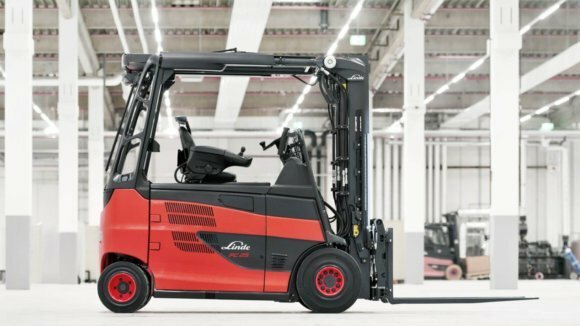 With the Linde-Roadster, an extraordinary forklift meets an extraordinary drive concept: Thanks to its sophisticated vehicle layout, it provides optimum load and driving visibility. The absence of the usual A-pillar makes a significant contribution in this regard. This could be dispensed with thanks to overhead tilt cylinders that absorb the lifting forces and direct them backwards via the overhead guard frame. The Roadster versions of electric forklift trucks Linde E20 to E35 score particularly well in logistics and industrial facilities with heavy passenger traffic. In addition, the driver can carry out precision work such as container loading more easily thanks to the significantly larger field of vision. Extraordinary forklift meets an extraordinary drive concept: the Linde-Roadster with fuel cell drive. “As the strengths of the Roadster come to bear especially in indoor areas, its combination with fuel cell technology seemed ideal to us,” says Linde expert Weinberger, explaining the expansion of the portfolio. After all, the energy system does not generate any harmful emissions during operation. Energy production is through a chemical reaction between oxygen and hydrogen. The electricity generated in this way feeds a lithium-ion battery, which in turn supplies the traction and lift motors; at the same time, the accumulator serves as an intermediate storage for recovered braking energy and as a “power reserve” for peak periods of demand. The only by-products during the process are heat and pure water. The latter is pumped off during hydrogen refueling. Speaking of refueling: This is where fuel cell technology reveals its greatest strength: A complete filling process takes a mere three minutes. This ensures maximum availability – especially in tough multi-shift operation, where the energy system makes a convincing case with its continuous power output. Since the simple, fast and clean filling process makes battery replacement obsolete, the fuel cell Roadster is ideal for use even in hygiene-critical sectors such as the pharmaceutical and food industries. Of course, the factor of economic efficiency plays a decisive role too. Linde expert Markus Weinberger: “Our investigations and practical tests prove that fuel cell systems can become economical with a fleet of around 20 vehicles plus. If the company already has its own hydrogen infrastructure because hydrogen is needed in its production anyway, the concept becomes even more attractive from an economical point of view.” In addition, there is a whole range of ecological benefits, starting with the comparatively long service life of a fuel cell – around 10,000 operating hours – and extending to CO2 savings if the hydrogen used comes from regenerative sources such as biogas or electrolysis using solar and/or wind energy.